* You are viewing the archive for May, 2008. View the rest of the archives. In my local mall’s food court, there is a restaurant / fast food place that offers some great food. I like their chicken teriyaki and admit to going to the mall a couple of times just to eat it. As I wait for my food, though, the people who work there proceed to essentially attack the people walking by and offer them free samples with a sales pitch mixed in. They don’t leave from behind the counter, but they scream from across the mall “chicken teriyaki with rice and vegetable. $4.99. free sample.” More often than not, the employees will add the words “hey lady” or “hey man” before the offer. From what I’ve seen, it doesn’t seem like an effective tactic. The other restaurants in the mall usually offer samples to potential customers much more subtly and more professionally. Adding a greeting like “hey lady” to a passerby is a completely inappropriate way to greet customers. The employees don’t have to be poets by any means, but being professional and polite in their communication with potential customers should be important. Samples aren’t meant to scare customers away, they’re meant to encourage customers to come and try some food and learn more. The way the Chinese food place at my local mall offers a sample is very different than the way Publix, the biggest supermarket company in my area, offers samples. If Publix does what I call “blind samples” where you haven’t shown interest in the type of food, they setup a booth, usually near the door, that is staffed by a Publix employee. He or she makes the food right there, the recipe is listed on a nice sheet on the counter, and the relevant food items are always near by. It’s done very well and very professionally. Publix also has another type of sample offering that I think is fairly common among grocery stores (Publix has about 100% market-share near me, so my experiences are relatively limited). If you are at the deli counter or at another such counter and want to try something, they’ll almost always cut you a slice or offer you a sample. They’ll offer you a sample to make sure its cut to your specifications or to ensure that what you ordered is actually what you want. It’s a very classy, and very effective way, to offer a sample. Publix’s method works, too. BusinessWeek named the company 19th on its “customer service elite” list (right between Apple and Hertz) and the company continues to get larger and become more profitable. Accountability is an issue that manages to confuse and perplex companies of all sizes. It’s tough to encourage accountability and forcing accountability among employees and departments is tricky at best. However, the other day I saw an amazingly simple, but also incredibly effective system for encouraging accountability and even communication among a group of employees. The place was a local restaurant that is a mix between fast food and a sit down restaurant. As such, it sees a lot of traffic. I went to use the bathroom and noticed there was a clipboard on the wall that said “bathroom cleaning log.” On it, the various employees who had cleaned the bathroom wrote their name, the date, and the time they had finished. It was inciredbily simple, but also very effective. As a customer looking at the log, I could tell the bathroom had been recently cleaned. As an employee, I could tell that same information, but also who did it last. This information can also be helpful to supervisors, other employees, or management (“the bathroom was spotless – great job!” or “the bathroom was distugusting – did you even clean it?”). The beauty of this system is that it’s a simple system of accountability to all. Sure, the list could be placed in the staff lounge, but then employees might forget and would have to go out of their way. It could be communicated via radio (“It’s me, Bob, I just finished cleaning the bathroom.”), but then it isn’t recorded and the accountability is not as noticeable. Both of these options also make it so customers have no idea when the bathroom was cleaned, either. The option they chose is a great solution. 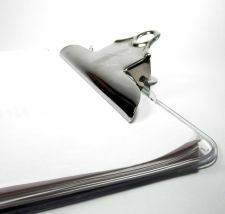 Simple systems of accountability, using just a clipboard and a pen, have the power to do a lot more than people think. Depending on your company, there are plenty of opportunities and places where you can implement similar systems. Think about them and see what you can do. Whenever I call a company and get a menu explaining the company’s hours of operations, I sigh slightly and begin to wish that a human had answered the phone. Yesterday, though, I was really hoping for that recording. I needed to find out the hours of operation of a division that is part of a bigger business that I knew had “limited” hours of operation at best (I later found out they were open 9 AM to 4 PM on Monday – Thursday and 10 AM – 1 PM on Friday). The only reason for me dealing with this business was that I needed something from their store and had to have it fairly quickly in order to complete a project I had been working on. I went on their web site, found a few references to this division, and even one to the hours of operation. The helpful answer? Call to get the hours of operation. I call the division. It rings for a minute or two. Then, I get the message that says the user’s mailbox is full. It doesn’t mention the division’s name and definitely not their hours of operation. I was out of luck. I call the company’s general information number and go through a series of menus. The person tells me one thing. While I was on the phone, I had opened a live chat and asked that representative the same question. I got a different answer. Needless to say, I wasn’t overly confident in either of the answers by this point. What I eventually ended up doing was picking a time that was in between both of the answers I got. When I went, the division was open and I was able to purchase what I needed. I did notice some interesting, though; the “hours of operation” sign on the store’s window had yet another set of hours listed. Have consistent answers available to all employees and in all locations. As a customer, it’s frustrating to keep getting (and seeing) different answers and different information. When you have such answers available and written down, publish them. 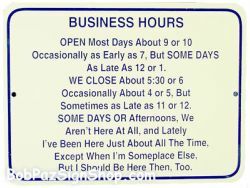 Store hours are not trade secrets, publish them! All information that is available internally that is not a big secret should be published publicly. It does not make sense to make simple information like store hours available to employees just so they can relay it to customers who ask. Test your phone number regularly and ensure that customers are able to call and get the necessary information without running into technical errors. Despite there being a plethora of tools out there designed to help make meeting scheduling easier (such as TimeBridge and others), the process is still an annoying one that affects pretty much everyone that works for a company that has more than a couple of employees. It’s maddening to try to schedule a meeting with a couple of people, all of whom are busy anyway, and be able to stick to that meeting in case something comes up or changes. So how do you avoid the madness? Make it a culture thing. Some companies (and individuals) really try their hardest to avoid re-scheduling meetings. I’ve been in a situation where I had a meeting scheduled with such a person. He found out that he was able to get free VIP Super Bowl tickets and was very upset that he to reschedule with me. I was later told by another employee that if it was really important to me, he probably would have missed the Super Bowl for our casual meeting. That’s dedication. I would never ask someone to do that (and he probably knows that), but the general mindset is what’s important. When you make a commitment, stick to it. Encourage your employees to do the same. When trying to schedule meetings, one of the best ways to make the process relatively painless is to send the person you’re trying to meet with several times and dates that work for you (or a couple of more general windows). This way, there is less back and forth with the scheduling. Alternatively, call the person to schedule the meeting. Sometimes a 5 minute phone call can save about 10 emails being sent back and forth. Whether it be a tool like TimeBridge or some sort of internal calendar program, having a system where employees can view each other’s availability is generally very helpful. It makes the process of scheduling meetings (especially among multiple people) much simpler and much less work for a majority of the attendees. And when you actually do have the tools, use them. 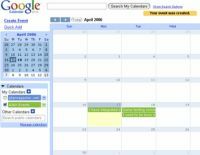 The more sophisicated calendars can do a lot of interesting things and it’s a waste not to use those options, especially when they can be helpful. DouglasMay 26, 2008Service Untitled Comments Off on Happy Memorial Day! As you might have noticed, there was no post today. The reason: I was enjoying my Memorial Day off. Posts will be back tomorrow as usual. Please take a moment to think about and remember the brave men and women who have lost their lives while serving for our country. The holiday was originally created to commemorate those who lost their lives for the Union in the Civil War, but now includes those who have lost their lives in any war or military action. This article about an interesting hiring practice at Zappos, the billion dollar shoe and handbag seller that’s known for its customer service, has been floating around recently. Essentially, Zappos pays its new employees to quit after a week or two on the job. After employees go through part of their four weeks of paid training, the company makes an offer to have them quit. The offer is pretty lucrative, too: a $1,000 bonus, plus whatever they’ve made so far. What the company is trying to do is essentially talk (and pay) people out of the job. Good companies try to convince new or potential employees not to work for them to some degree. They are looking for employees that will be dedicated to the company and to their jobs. Employees that don’t have that level of dedication aren’t worth it. By paying its new employees to quit, Zappos is weeding out the employees that aren’t in their jobs for the right reasons. If the particular employee is willing to leave the company for $1,000, then Zappos doesn’t want them. It’ll save the company money and employee a lot of unhappiness in the long run. Companies like Zappos depend on their customer service to differentiate themselves. There are a million places to buy shoes, about half of which offer a way to buy the shoes over the Internet. Zappos depends on its customer service to be number one. And they do a great job at it. Customer service, though, is dependent on people. People are the lifeblood of any customer service company. Without good people, it’s impossible to have good service. By offering new employees $1,000 to leave, Zappos is leaving itself with only the best people. The ones that stay are the ones that are committed to their jobs, to Zappos, and to customer service. They’ll have a great career providing great service at a great company. Zappos needs employees like that to continue to provide great service. As soon as the people at Zappos come to work thinking it’s just a job for just a paycheck, there will be a serious problem. Those “I just want a paycheck” employees are usually just fine at providing average service at average companies, but they’re rarely exceptional. I’ve gotten to know Zappos not only through my interview with the company’s CEO, Tony Hsieh, but also from listening to Tony speak at Customer Service is the New Marketing and working with him on that. They’re a unique company and one that I think any customer-centric company could learn a lot from. They know what it takes to be exceptional and they do a great job at being exceptional. I read about a relatively new site the other day called Alltop. It was started by venture capitalist and author Guy Kawasaki and seemed to be an interesting site. I sent them an email suggesting they add Service Untitled to the site’s marketing category and sure enough, they agreed. Service Untitled is now officially part of Alltop’s Marketing category. On a somewhat unrelated note, my apologies for a lack of a post yesterday. I had actually written a post earlier in the afternoon when I didn’t have Internet access (the government customer service one), but forgot to publish it when I got back to a place with Internet access.